The big question on everybody’s mind when The Force Awakens movie posters came out was: Where is Luke? Well, we now know there was a reason he was missing from the posters (BTW, brilliant marketing guys! ), and just like the movie, we have been saving Luke for the very, very end. Today is the last of our The Force Awakens pixel pattern series. Starting next week, we are going to back to featuring brand new (already completed) patterns from the Original and Prequel movies as well as the TV series Clone Wars. We have a Rebels series in the works (and #1 is really pushing to make them soon!). By request, we are also making more ships and vehicles. That should keep us plenty busy until we tackle Rogue One in the fall. If there is something specific from Star Wars you want us to feature, let me know, and I’ll try to work it into the schedule. I should also mention that I also do commissions. If there is something/someone special you want a pattern or a finished piece of, contact me and we’ll talk! 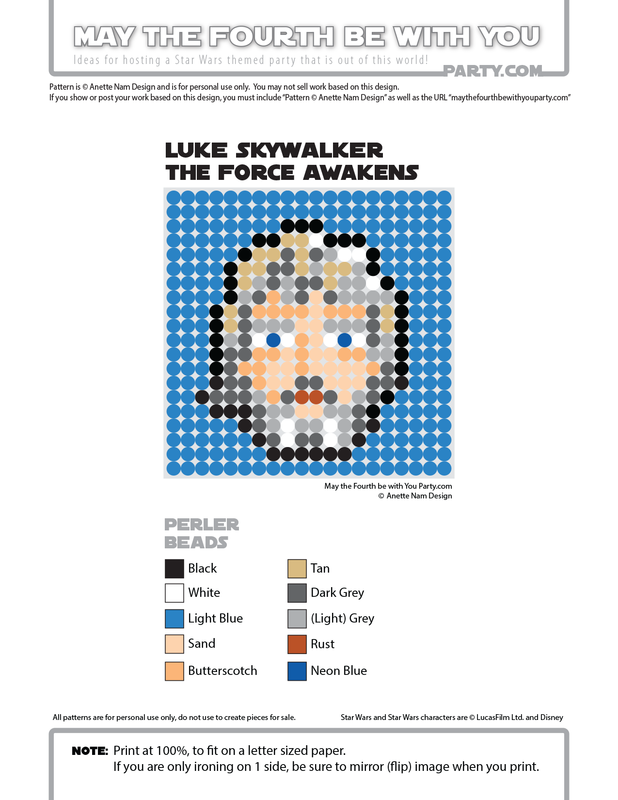 Now, here, finally, is old Luke – the 19th, and last of our The Force Awakens patterns, and #48 in the Perler bead/cross stitch/crochet/knitting/Lego/pixel/mosaic pattern series. If you are looking for A New Hope Luke pattern, you can find that here. NOTE: We spent A LOT of time making these designs, and are absolutely thrilled to see that they are becoming so popular, but we want to remind you that we should get credit when they are used. So, if you show your work using our designs anywhere (online as well), put a “Pattern © Anette Nam Design” and link to “Maythefourthbewithyouparty.com” somewhere close by. THANK YOU! … and as always, you may not sell any products made with these patterns.